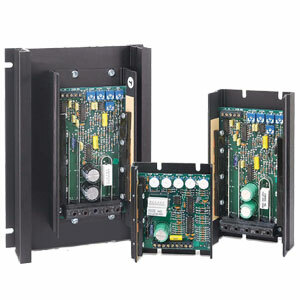 The OMDC-65 Series DC drives are high performance Pulse Width Modulation (pwm) speed controls for 12, 24, and 36V batterypowered equipment providing smooth control with high efficiency operation. The advanced design permits a substantial increase in the equipment running time between charges over conventional techniques. Features include adjustable maximum speed, minimum speed, current limit, I.R. compensation, and acceleration. The adjustable current limit feature protects the control, battery, and motor from sustained overloads. The higher capacity models also provide thermal protection. The 65 Series controls are designed for heavy-duty battery operated permanent magnet DC motor applications, such as: floor scrubbers, small personnel carriers, AGV’s, agricultural sprayers and a vast variety of portable equipment. All the 65 Series speed controls come standard with a speedpot, knob and dial plate. Note: Comes complete with operator’s manual, speedpot, knob and dial plate.